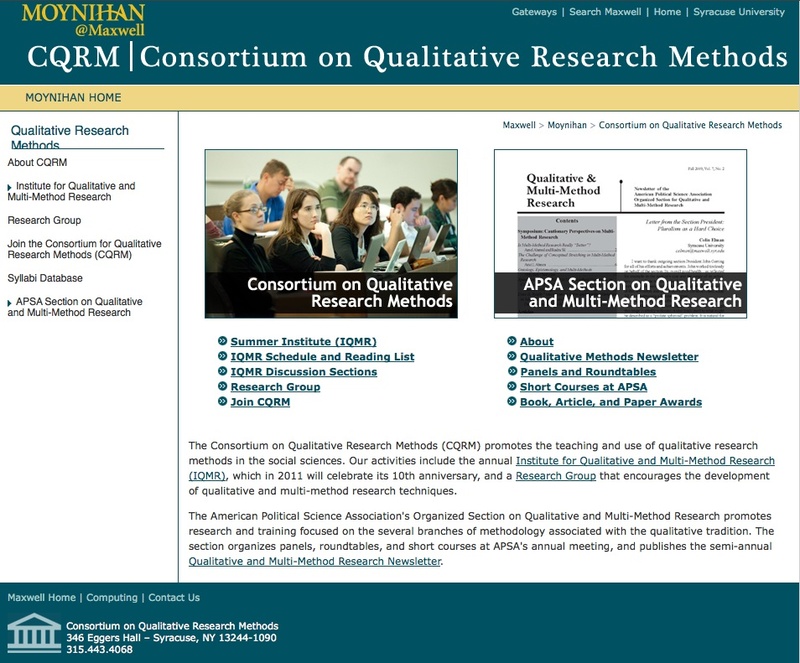 Hosted by the Maxwell School at Syracuse University, the Consortium on qualitative research methods promotes the teaching and use of qualitative research methods in the social sciences. Its members include departments, centers and/or institutes of several universities. The website provides information about the Consortium activities and its staff, teaching material (such as syllabi and seminar schedules), and a fair quantity of working papers, presented with annotations and full-text downloadable. The Consortium also participates – and links – to the APSA section on Qualitative Methods and to the 2005-founded APSA Working Group. Annual trainings on qualitative research methods are also organized, whose online materials and articles are nevertheless reserved to participants. Updating is not frequent and varies according to section: information about teaching activities are added every year while publications are posted on the web less regularly and according to research timing. Records can be located only by browsing through categories without search features (very few connections to external websites are provided). Users are allowed to navigate and to access materials completely free of charge. With its simple content categorization, this website enables an immediate orientation — although the basic structure is quite uninviting to further inquiries. are reference services providing access to specialized data banks containing full-text journal articles, books and book reviews. Some services – such as Jstor - represent pioneer non-profit efforts to provide libraries and academic institutions with historical backfiles of scholarly journals by converting the back issues of paper journals into electronic formats (pdf) and improving access to the journal content. Other commercial services – as Questia and NetLibrary – provide institutional or private users with access to a large collection of online books or journal articles.